Providers are uniquely positioned to identify patients’ anxiety disorders and help them to cope with or overcome them. Professionals working in primary healthcare settings are likely to come into contact with older adults suffering with anxiety disorders. These disorders are often difficult to distinguish from the normal worries of older adults, from nervous personalities, physical illnesses with symptoms similar to some that accompany anxiety, and mental and emotional changes related to the development of cognitive impairment or dementia. Physicians can play an important role in helping patients cope with anxiety disorders and possibly overcoming them. Making such strides against patients’ anxiety requires providers to learn to identify anxiety disorders, provide or recommend specialized interventions, and learn when and how to provide formal treatment. In most cases, providers can be instrumental in taking steps to alleviate their patients’ suffering from anxiety disorders. This article provides an overview of anxiety disorders, how to identify them, and what measures can be implemented to address them since medical professionals are on the frontlines to help older adults with mental health issues. Anxiety disorders are of serious concern. While the state of anxiety—an experience of tension and apprehension—is an ordinary response to a threat or danger, excessive anxiety that causes distress or interferes with daily life is not a normal part of the aging process. Like all mental disorders, anxiety disorders may be considered mild, moderate, or severe, depending on how extensively they interfere with functioning. They also may co-occur with other mental disorders, especially depression or substance abuse. The current Diagnostic and Statistical Manual of the American Psychiatric Association identifies six types of anxiety disorders: generalized anxiety disorder (GAD), social anxiety disorder, specific phobia, panic disorder, obsessive-compulsive disorder (OCD), and posttraumatic stress disorder (PTSD). • GAD is “the almost constant presence of worry or tension, even when there is little or no cause.”5 Worries drift from one situation to another, related to concerns such as family issues, health, and traveling. • Panic disorder involves “repeated attacks of intense fear that something bad will occur when not expected. … A panic attack begins suddenly and most often peaks within 10 to 20 minutes. Some symptoms may continue for an hour or more. A panic attack may be mistaken for a heart attack [or another serious health problem].”8 Panic disorder is rare among older adults. • OCD is a combination of painful thoughts with which a person is obsessed and actions performed compulsively to get rid of the thought temporarily or at least to reduce the pain of it.9 The prevalence of OCD is low among older adults. • PTSD is a “potentially debilitating anxiety disorder triggered by a traumatic experience such as … physical or sexual assault, exposure to disaster or accidents, combat, or witnessing a traumatic event.”10 It involves painful reexperiencing of the traumatic event(s) and efforts to avoid similar events. Research shows that PTSD onset may be delayed until later life or that symptoms may reemerge. Anxiety disorders are not easy to identify. They are often exacerbations of normal worries or long-term personality traits. Older adults frequently experience anxiety symptoms as physical problems such as headaches, gastrointestinal distress, fatigue, and the like. As noted above, anxiety disorders often co-occur with other disorders that produce symptoms similar to anxiety. These issues pose significant detection and diagnostic challenges. • Eating: People who are anxious may overeat to calm themselves and subsequently gain weight, or they may skip meals and lose weight. • Sleeping: People who are anxious may sleep to avoid their fears or stay awake ruminating about imagined or exaggerated dangers or in an effort to avoid bad dreams. In addition to asking questions, there are several screening tools that can be used to obtain a preliminary indication of a patient’s anxiety disorder. Perhaps the easiest to integrate and use in a primary healthcare setting is the GAD-7 scale,13 which is a self-administered and brief assessment measure. Of course, self-administered screenings are of limited value if the person taking it has significant memory loss or cognitive impairment. Sometimes caregivers can provide the needed information, but they do not always know the inner thoughts and feelings of the person for whom they are caring. A screening tool does not produce a diagnosis. It gives a good indication that a diagnosis may be warranted, but the diagnosis itself must be made by a professional with appropriate expertise. Healthcare professionals who provide services to older adults can intervene in ways that can be helpful to those with anxiety disorders. Sometimes, however, it is critical for treatment to be provided by or in consultation with a geriatric mental health professional. Helpful interventions include various forms of support and guidance, psychotherapy, and—if used with caution—psychiatric medications. For some older adults with anxiety disorders, a relationship with a caring person who directly addresses isolation and inactivity can be very helpful. This can be a family member, a friend, a physician, a worker at a senior center, a clergyman or chaplain, or others. Engaging people suffering from anxiety in social, creative, or other activities they find interesting can be very helpful. Helping older adults manage matters that may be a source of anxiety, such as dealing with health issues, financial matters, and concerns about being a burden to others, can make a big difference. In addition, spiritual experiences can be helpful for many older adults who believe in God or some transcendental reality. Some elders find that meditation eases their anxiety. Such therapies include cognitive-behavioral, problem-solving, and interpersonal therapies, all of which require specialized training. Of the three, problem-solving therapy can be learned most quickly. There is a growing dispute about the use of pharmacological interventions for older adults, particularly those with chronic health conditions, because of the physical health risks associated with psychiatric medications, including antianxiety agents, antidepressants, and antipsychotics. The risks are particularly high for people taking prescription painkillers, which now are the major cause of drug overdose deaths and are often used in combination with other drugs, such as barbiturates and benzodiazepines, to treat anxiety.15 There are also higher risks for people with dementia and perhaps for people with mild cognitive impairment. Nevertheless, psychiatric medications are frequently used to treat older adults with anxiety disorders, and they can be helpful either alone or in combination with psychotherapy. Most commonly prescribed are benzodiazepines such as Xanax, Klonopin, and Ativan. Buspirone is an effective treatment for GAD, but there are limited data on its efficacy among older adults. For older adults with co-occurring depression, PTSD, or social anxiety, antidepressants are often prescribed. Given elders’ health risks associated with these medications, it is preferable for them to be prescribed on a short-term basis at the lowest effective doses with careful monitoring regarding their effects on blood pressure, heart conditions, balance, etc. Because primary care providers are often in the best position to identify anxiety and other mental disorders and because they frequently provide treatment for mental disorders, there is now a greater emphasis on integrating the delivery of physical and mental health services in primary care settings. • a disease management approach that has proven to be very effective for older adults with depression and could likely be effective for other disorders as well. This is an approach in which a physician (or nurse practitioner) makes a diagnosis and usually prescribes a medication after which a nurse, social worker, or other trained individual follows up with the patient regarding medication and other needs and may also provide short-term psychotherapy, such as problem-solving therapy. Unfortunately, these models of integration are of very limited usefulness in areas of the country where there are vast shortages of mental health professionals. In these areas the most promising approach is the use of telemedicine, particularly to provide consultation to the primary care medical personnel who are seeing the patients in person. Telemedicine can also be used for diagnosis and psychotherapy. Because it is possible to help older adults cope with or even overcome anxiety disorders, it is important to learn how to identify anxiety disorders, how to provide helpful, supportive interventions, and when and how to provide formal treatment. Most older adults with anxiety disorders do not have to suffer endlessly. Physicians can be proactive in providing help for them. — Lisa Furst, LMSW, is director of education for the Geriatric Mental Health Alliance. • Mrs P is 76 years old. She has been a “worry wart” all her life, but since her husband died, she has become so anxious that it is difficult for her to manage basic routines. She can’t concentrate or make day-to-day decisions. She feels restless almost all the time. She has trouble sleeping because her mind fills with worries. She visits her doctor frequently with complaints about headaches and stomach problems. There is no physical explanation for her symptoms, and she spends much of her time with the doctor talking about her many worries. These include her feeling that no one will enjoy her company, that she’s just not fun. She doesn’t want to burden people with her presence so she has become increasingly socially isolated. Left alone with her thoughts, she becomes even more worried. This form of generalized anxiety is not uncommon among older people. • Mrs C lived alone in the apartment in which she and her husband raised their children. She has always been a bit distrustful: The butcher put his thumb on the scale to increase the weight of meat being measured; a teacher had it in for a daughter who wasn’t doing well in school. After her husband died, her suspiciousness grew into paranoia. Mrs C came to distrust even her daughter, accusing her, for example, of stealing Mrs C’s diamond ring, which she had simply misplaced. Her daughter was tolerant to a point but eventually arranged for help in the home, hoping she wouldn’t have to face her mother’s abuse every day. “You say my daughter sent you,” the mother yelled through the door. “I know you’re from the CIA.” She refused to open the door. Eventually Mrs C was admitted to the hospital for treatment of pneumonia. Her daughter and the social worker agreed that, given her growing physical disabilities and the difficulties she presented at home, she should go to a nursing home. Mrs C never went home again, an outcome not uncommon for people who cannot accept help in the home. • Mr J had always been a “neat freak.” He wanted everything in its proper place—none of the children’s toys in the living room, no laundry on the floor, and so forth. His wife, who didn’t much care about how their home looked, accommodated his idiosyncrasy over the years. But after she died, he became increasingly insistent that nothing be out of place. If a picture on the wall was crooked, he became wildly uncomfortable until it was back in place. Sometimes he felt anger that his wife had died and left him. Then he was afraid that God would punish her unless he made amends by washing his hands. This happened many times each day. He did not leave the house because he had to be near a sink. He had developed severe obsessive-compulsive disorder. • Mr F was a survivor of numerous battles in the Pacific during World War II. Eventually he was taken prisoner by the Japanese, a terrible experience he survived because he was in great physical shape and was able to distance himself psychologically from the pain he experienced every day. Remarkably, when he returned home after the war, he became a lawyer, married, raised a family, and did not appear to suffer any psychological scars from the war. At the age of 81, he showed marked signs of dementia, and over time he began to have horrible dreams of what he had lived through during the war. Dementia broke down the barriers against terror that he had built when his mind was fully intact. He had developed posttraumatic stress disorder more than 50 years after the fact. 1. Byers AL, Yaffe K, Covinsky KE, Friedman MB, Bruce ML. High occurrence of mood and anxiety disorders among older adults. Arch Gen Psychiatry. 2010;67(5):489-496. 2. Kessler R, Berglund P, Demler O, Jin R, Merikangas KR, Walters EE. Lifetime prevalence and age-of-onset distributions of DSM-IV disorders in the National Comorbidity Replication Survey. Arch General Psychiatry. 2005;62(6):593-602. 3. Wolitzky-Taylor KB, Castriotta N, Lenze EJ, Stanley MA, Craske MG. Anxiety disorders in older adults: a comprehensive review. Depress Anxiety. 2010;27:190-211. 4. Gellis ZD. 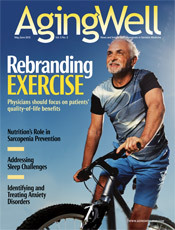 Evidence-based practice in older adults with mental health disorders. In: Roberts A, ed. Social Work Desk Reference. 2nd ed. New York, NY: Oxford Press; 2009: 843-852. 5. Generalized anxiety disorder. PubMed Health website. http://www.ncbi.nlm.nih.gov/pubmedhealth/PMH0001915. Updated April 11, 2011. 6. Social phobia. PubMed Health website. http://www.ncbi.nlm.nih.gov/pubmedhealth/PMH0001953. Updated February 14, 2010. 7. National Institute of Mental Health. Anxiety Disorders. Bethesda, MD: National Institute of Mental Health; 2009. NIH Publication No. 09-3879. 8. Panic disorders. PubMed Health website. http://www.ncbi.nlm.nih.gov/pubmedhealth/PMH0001922. Updated April 11, 2011. 9. Obsessive-compulsive disorder. PubMed Health website. http://www.ncbi.nlm.nih.gov/pubmedhealth/PMH0001926. Updated February 11, 2010. 10. Combined pharmacotherapy and psychological therapies for post traumatic stress disorder (PTSD). PubMed Health website. http://www.ncbi.nlm.nih.gov/pubmedhealth/PMH0014403. Updated June 8, 2010. 11. Lyketsos CG, Lopez O, Jones B, Fitzpatrick AL, Breitner J, DeKosky S. Prevalence of neuropsychiatric symptoms in dementia and mild cognitive impairment. JAMA. 2002;288(12):1475-1483. 12. Brennan M, Vega M, Garcia I, Abad A, Friedman MB. Meeting the mental health needs of elderly Latinos affected by depression: implications for outreach and service provision. Care Manage J. 2005;6(2):98-106. 13. Spitzer RL, Kroenke K, Williams JBW, Lowe B. A brief measure for assessing generalized anxiety disorder. Arch Intern Med. 2006;166:1092-1097. 14. Böttche M, Kuwert P, Knaevelsrud C. Posttraumatic stress disorder in older adults: an overview of characteristics and treatment approaches. Int J Geriatr Psychiatry. 2012;27(3):230-239.